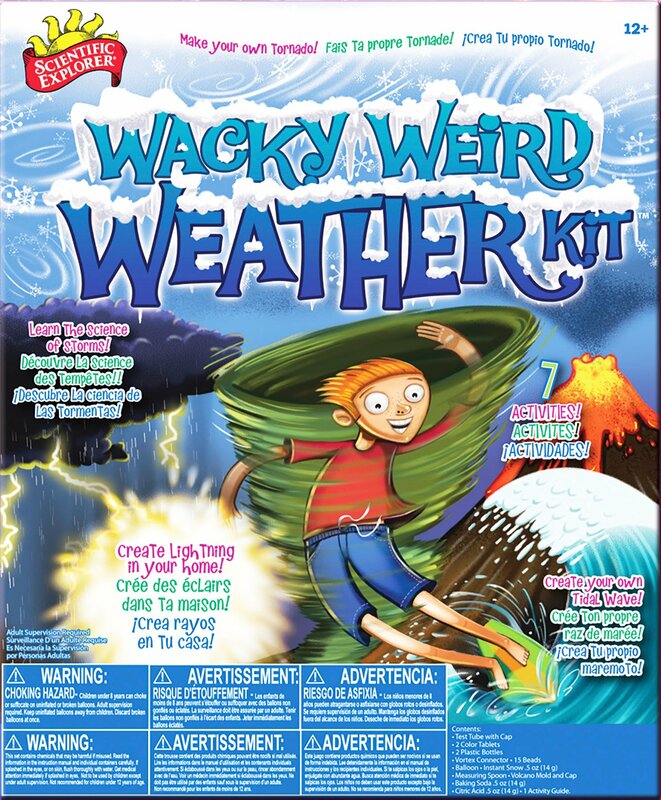 Scientific Explorer Wacky Weird Weather Kit is an educational make-it-yourselfset that allows your child to uncover secrets behind our weird and wackyweather. This set is designed to inspire young scientists to understand thescience of storms in order to make a tornado, create a tidal wave, make theirown powerful weather effects, create lighting at home, make their own stormfront and whip up a blizzard in a test tube. Questions like "What makes aTsunami?" and "How does a volcano make rain?" are just a few of topicsaddressed in this kit. Your child will learn to act and think like a realscientist by comparing things, asking questions and making observations bytheir different senses to understand the really fun and cool science aboutweather and what makes it so weird. Includes instant snow (0.5oz. ), bakingsoda (0.5oz. ), citric acid (0.5oz. ), test tube with cap, 2 color tablets, 2plastic bottles, vortex connector, 15 beads, balloon, measuring spoon, volcanomold with cap and instructions. Recommended for children 12 years of age andolder. From the Manufacturer Scientific Explorer exceptional series of home science kits based on thenationally recognized Great Explorations in Math and Science (GEMS) programpioneered at UC Berkley's Lawrence Hall of Science. These kits teach valuablelessons about the scientific method and how to propose, test and refine yourhypothesis. Exploratory learning improves memory and keeps kids engaged withhands-on learning experiences. Kids will love it and learn at the same time.Scientific Explorer is a member of the ALEX Brands family of products. Visit for more information on ALEX Brands and our best-selling line of educational and entertaining products for kids.